The new Rukka AirAll Jacket finally provides another option for people looking to wear that amazing Cordura AFT. The same materials used in Airman jacket are now being used in what looks to be a much more sporty option from Rukka. The AirAll is made of full Knitted Cordura AFT and AFT Plus with two layers on the elbows for extra abrasion resistance. The jacket has full D3O Air armor including a full back protector. That combined with the amazing abrasion resistance offered by Cordura AFT will make this a bomb proof jacket. 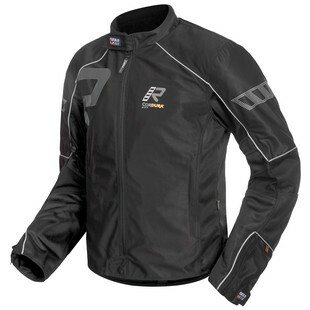 This jacket looks to have a more slim cut than the current Rukka gear that we have available. The jacket comes with velcro closures on the collar as well as adjustable sleeve ends with adjustments on the lower arms. The jacket also has five pockets as well as a waterproof pocket on the inside of the jacket. The sleeves chest and back have reflective materials on them. This jacket looks like it will be an awesome summer jacket. I will be sure to pick one up myself if it is released at the right price point! I am really looking forward to seeing this in person.